The advancement of technology has played a big role as far as interior décor is concerned. If you need a style or a design in your house walls you can always use wallpapers. Having a focal point on your walls is something which draws your eyes to the wall and can help you pull the rest of your design scheme together. The emergence of wallpapers has changed the way people decorate their houses. Are you wondering which are the best wallpapers that you can install in your house? Non woven gold wallpaper is the best wallpaper that you can use because of its high durability and easy maintenance. It is suitable for all rooms in a house and working with it is easier than with other types of wallpapers. 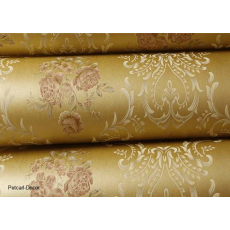 Non woven gold wallpaper is wipeable and least resistant to scratching. Make a wise decision and buy quality and affordable wallpaper from Petcarl Décor.